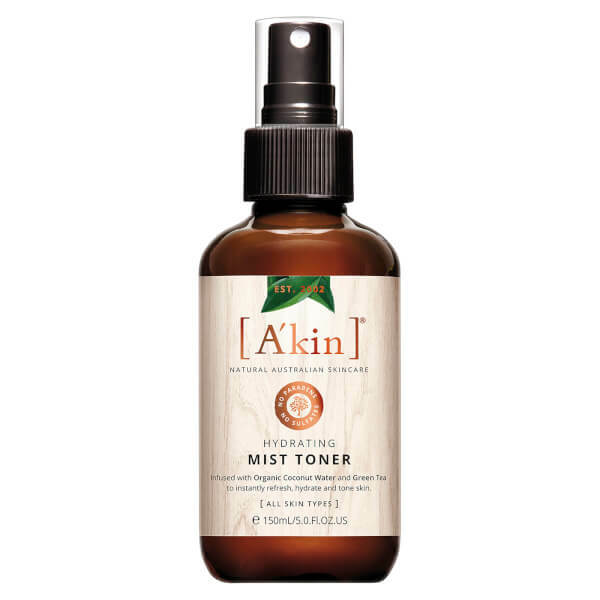 Clarify and refresh your complexion with the A'kin Hydrating Mist Toner; a pH balanced, revitalising formula that sweeps effortlessly over skin to smoothen and refine. Infused with a cocktail of beneficial ingredients, including Organic Coconut Water, Green Tea and Chamomile, the lightweight toner soothes and cools skin, whilst delivering long-lasting moisture and hydration to leave skin soft, comfortable and replenished. Housed in a convenient spray bottle. Water (Aqua), Cocos Nucifera (Coconut) Water *+ , Glycerin*, Camellia Sinensis Leaf Extract (Green Tea)*, Cocos Nucifera (Coconut) Fruit juice*+, Chamomilla Recutita (Matricaria) Flower Extract*, Citric Acid, Sodium Levulinate*, Sodium Anisate*, Potassium Sorbate, Linalool^, Limonene^, Geraniol^.